The Vision: Can we ensure this is delivered before the Mayor leaves office? This week's papers are awash with the news that the Mayor is planning to stand as an MP next year. What that suggests, to my ears at least, is that we may have (at best) a not fully focussed Mayor on the job in 2015. And that could have major ramifications for cycling. Why so? Well, next year is when the first really chunky deliverables are due from the Mayor's "Vision for Cycling". The Vision for Cycling was announced in March 2013 and it consists of a package of nearly £1bil to be invested over 10 years in Quietways, the central London cycling grid and new 'super highways'. Most significantly, the "Vision" is all about building cycle infrastructure that actually looks and feels like cycling infrastructure, and is lightyears more advanced than the Mayor's original 'Cycling Revolution' launched in his first term in office and which gave us extremely poor quality cycle super highways at vastly higher cost than their much higher quality counterparts in other countries. Getting the Mayor to commit to re-launch his "Vision for Cycling" in 2013 took years of lobbying, of protests, of political, media and public pressure. And the results of that pressure are only just, very cautiously, peering above the parapets. 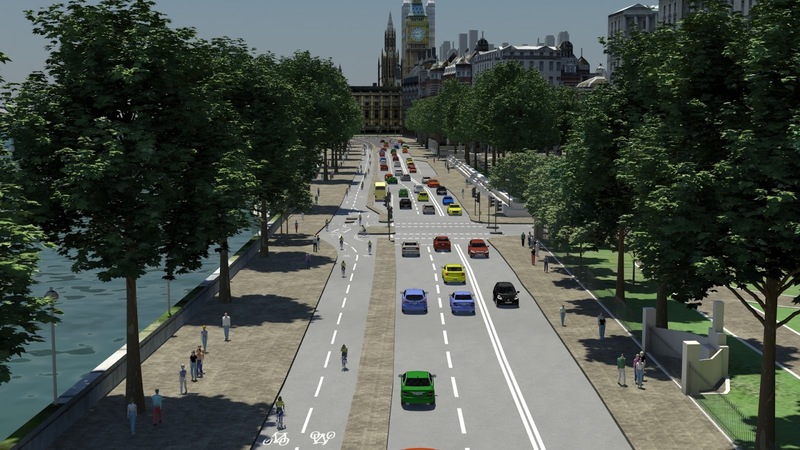 So, for example, we have recently seen the consultation documents for cycling-friendly junctions at Oval and Vauxhall. The plans for these junctions are an enormous step up on anything we've seen planned in inner London before. They pave the way for junctions that treat bicycles as a legitimate form of transport. What's more, they also create better space for other people as well. The Oval junction is like an urban desert, the whole zone north of the tube handed over to speeding cars to and from central London. Creating a cycle-friendly space here should be the first step in rehabilitating that area, making it a better space for everyone, not just for car drivers who are in any case in the minority. At last week's City of London cycling forum, Nigel Hardy - the man responsible for implementing cycle infrastructure for Transport for London (and improvement schemes for all other road modes as well, but in this case, with a cycling hat on) - gave a long presentation about TfL's plans for cycling over the next few years. What was apparent from Hardy's presentation was that the Mayor's Vision for Cycling is starting to become something tangible. Hardy talked about plans for the East-West cycle super highway that will run along the Embankment and about plans to run a bi-directional cycle track from the Elephant, over Blackfriars Bridge, to redesign the junction at the northern end of the Bridge and carrying onup to Farringdon. He asserted that "the case for segregation is understood" on these roads. But he also pointed out that all these major schemes are due to roll out to consultation in September and building due to start in late 2015 or 2016, ie quite possibly after the Mayor has shifted his focus elsewhere. What is absolutely clear about both the Embankment and Elephant to Farringdon schemes is that they very clearly take road space away from its current usage and create space for cycling. Justafiably so. If you look at the numbers on Blackfriars, you'll see that 47% of 'traffic' crossing the Bridge at rush hour is now made up of people on bikes. Just have a think, though, about the forces that will be shouting and screaming about that re-allocation of road space from its current usage. I can very easily see a combination of stuck-in-the-mud business groups (Freight Trade Association among others) shouting very loudly in protest at plans to take out a lane of motor traffic on the Embankment, for example. These groups have good links to a couple of very senior TfL folk who are not particularly enamoured of cycling. Add into the mix a Mayor who is in the process of leaving his London role behind and for whom cycling may no longer feature quite so high on the agenda. Put those forces together and we have to consider the possibility that the next 12-18 months will see a string of major cycling investment schemes rolling off the conveyor belt at the design stage and ready to get built but landing into a sea of protests from groups that don't want anything to change and then slumping into a possible lack of strongwilled support for change from a Mayor whose thoughts could easily be elsewhere. That could easily lead to inaction and mean the Vision for Cycling stays as not much more than just that - a vision. This is the problem I've had with the Mayor for some time. In my view, he royally ballsed-up his first attempt to create a cycling revolution by frittering money on poor quality schemes when he could have used his first term to get meaningful change on the ground. Now that he's finally promised change, he could be leaving too late to actually see that change bear fruit. That said, the Mayor did lobby for and did obtain the funding to create cycle-friendly junctions and new routes and full credit to his team for that. That funding is now (more or less) in the hands of Transport for London. And TfL is preparing to invest that money in 2015, 2016 and beyond. What is going to be critical over the coming months is that people continue to lobby and support TfL to actually deliver those big changes. My sense is that we need to show TfL there is a real groundswell of support for the schemes that are coming down the line. That starts with Vauxhall and Oval for now. In September, that will mean Embankment and Farringdon to Elephant. Sure, there will be gripes with the schemes and we should point out where they fall short of expectations. But I'd urge people to focus on the bigger picture and help TfL to get these things on the ground before the political wheels start to slow down. You can make a start by ensuring you have your say on the schemes for Vauxhall and for Oval. And in September, get behind the plans for the East-West cycle super highway, and for the Elephant to Farringdon plans. Let's make sure the Vision for Cycling actually happens and let's not allow anyone to derail it before it even gets started.